The way you dance reveals about your personality, scientists discovered. This means that according to them, the dance floor is the perfect place to find a partner. The way someone moves to music reveals secrets about his character. The researchers shared ‘guinea pigs’ on the basis of personality tests in five different types. - Extrovert people their body most move around on the dance floor, they often make energetic and exaggerated movements with arms and head. - Neurotic people dance with sharp and sudden movements with the hands and feet. - Reflex output personalities go for more flexible styles of dance, they move sideways when they move their hands. - People with an open mind to make more rhythmic up and down movements, they are not around as much as others. - Accurate and conscientious people move much on the dance floor, their hands go even further apart. Finnish Professor Geoff Luck "Music arouses strong emotions in people, it can be expressed through body movements. Others use this as an indication of their personality. The link between certain dance styles and each of the types was strong. also the kind of music did the different types do different dances. Rock music creates the stereotypical head banging move, especially with extroverted people. Those with an open mind made more rhythmic gestures with the limbs than others on techno music. Reflex output individuals move more confident in latino music. Rock music is the only genre that neurotics lures out their closet to make just small, nervous movements." Luck continues: "Some movements are more specific to certain genres, jazz music makes people for example moving with their head or tapping their feet." 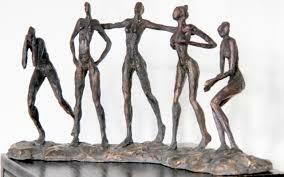 Psychologist Peter Lovatt says that dance and move conveys subtle messages about the feelings and thoughts of people. "This is because dancing for centuries is associated with sexual selection and is an important part when choosing a mate. The way we move on the dance floor also changes with age and the amount of self -confidence."